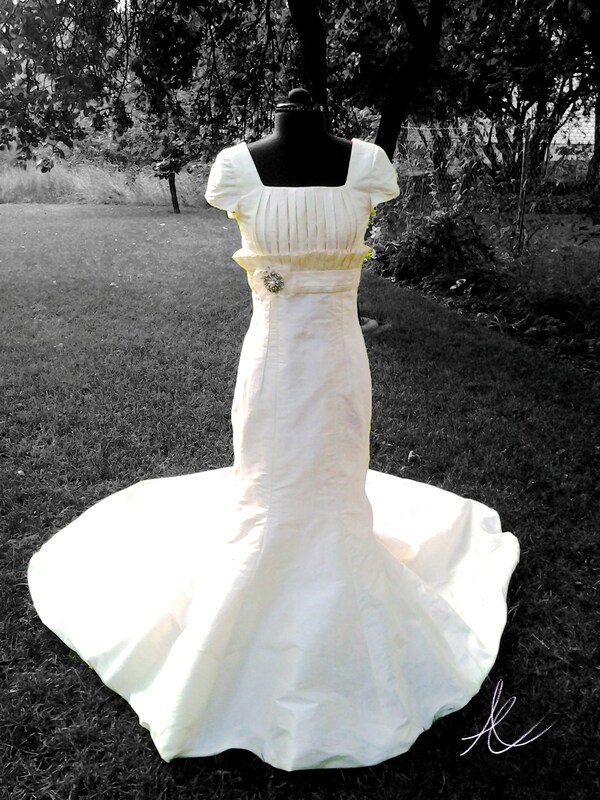 I have no doubt if you follow my blog that you have been waiting with bated breath to find out the outcome of the wedding dress project…or if I am being realistic you’ve probably forgotten actually about it. As many design projects go & what seems to elude most of the public…designing is a long-planned out process, Nothing is created in a half an hour to an hour segment. Despite what the media wants you to think there is rarely any instant gratification in the design world. The itself dress started out as a conversation in April. Nicole (if I had, had another daughter I would have named her Nicole, love the name) has known me since 2004 when I worked as the Interior Design Director for a large home builder. She was the sassy little receptionist who kept everyone on their toes with her playful sarcasm & quick wit. Things have long since changed & we are both in different places in our lives…the builder is no longer around…but as facebook friends we have made sure to keep tabs on each other. According to her I told her way back when that I would be happy to make her wedding dress when she had asked me. Other than the costumes I made on Halloween’s for my children I am not sure how she knew that I had a thing for needle & thread. Okay I don’t…not exactly. Needles & thread are really a means to an end. What I love it designing. I have been sewing since I was five. I started out by designing dresses for my Barbie’s. I really never played with them I just sewed & designed clothes for them. I was very common to find my naked doll with her feet stuck in the bottom of a large spool of thread so she would be held upright, acting as a dress form. The truth is my plan was to be a fashion designer first…others things happened though. I am essentially self-taught & during my teens I would devour every book on clothing construction I could find & back then it wasn’t easy to find such publications. Most of the instructional books were from the 40’s & 50’s. So there is a little History for you. Nicole & I discussed the dress & she came to visit a couple of times to go over things. I encouraged her to go look around at prices & styles before she made the decision to have me make it. I wanted her to be completely committed to the process because it is a huge commitment on my part as well & because she lives in Vegas & I live in Utah she would have to arrange to come here for fittings. After a few rather discouraging shopping trips & going over photos with me of what she loved & didn’t she decided to give me a shot. Kudos to her for faith because she hadn’t seen what I could do yet. All she knew is that I can sew. I pulled together some concepts to help her narrow down the look she wanted based off her preferences & emailed them to her & waited to hear back. It cracks me up now thinking about it but I think it is an important part of the process. This is something I encourage my clients to do in the most appropriate manner, & that is communicate. No matter what we are designing we don’t read minds & we need your considerate feed back. We also need you to be present in the process. “April” she said, “I love these but I was wondering if you can add a ruffle?” She was so nervous when she said this, uncertain of my response. She had tried on a dress with crumb catchers…huge ruffles on the bodice that drowned her but she got emotional when this happened because it reminded her of a cake she loved…this is the key. The emotion. We designers want results that get to the heart of your dreams & desires…the emotion is a clue to which direction we should take. I was so happy that we had hit that deeper level. 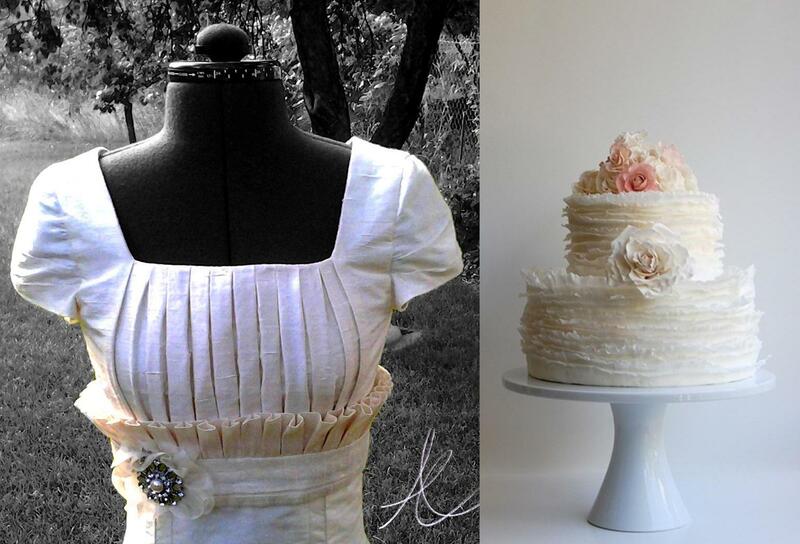 I asked her to please send me a picture of the cake & that became my inspiration for the dress. This was a 400+ hour process. Between concept drawings, creating the pattern & a mock-up dress out of muslin first to making the actual dress it is a big job. We were able to coordinate everything smoothly with her visits from Vegas for fittings which had me more that a bit nervous. Designing & making a custom dress for someone who lives nearby is one thing, but one who lives in another State is different story. I am happy to say that she is thrilled & she looks amazing in it. It is perfect for her…made just for her. I also have a new love for ruffles…as long as they are done correctly. I affectionately call them Fruffles now. If you follow me on Facebook, twitter or Instagram you may be so lucky as to see the bride in the dress since I plan to take pictures tomorrow night at the reception. Also I ask my friends & sister Heather in Arizona for forgiveness from with holding photographs until now.